We are excited and proud to unveil the design for the AMD Awareness Pin — a tool that empowers you and the whole AMD community to raise awareness at the grassroots level. 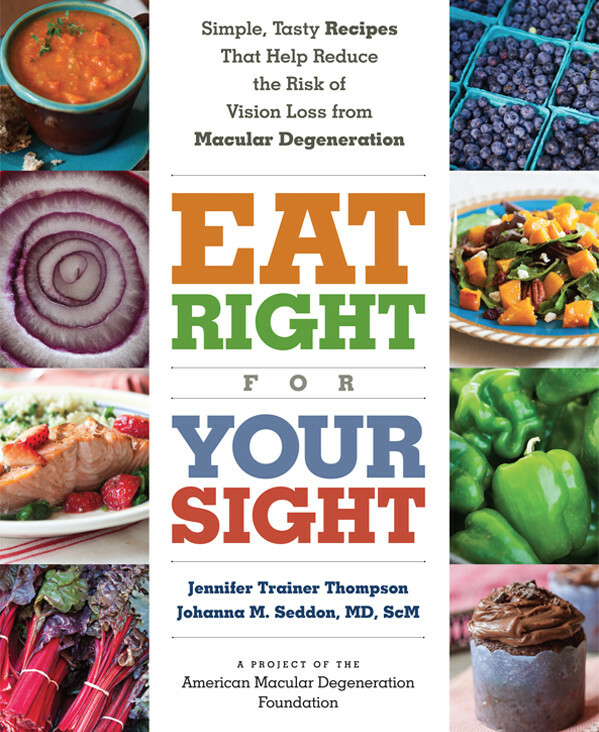 Even though age-related macular degeneration (AMD) has become an epidemic — it’s the third leading cause of blindness worldwide, the leading cause of blindness here in the U.S., twice as prevalent as Alzheimer’s, and as prevalent as all forms of cancers combined — it remains a largely invisible and little understood disease to the general public. AMD is invisible to the naked eye. Only the visible, behavioral symptoms of more advanced vision loss might give someone a clue. When people can’t see something, they can’t ask about it. They miss the opportunity to learn how to reduce their own risk. They can’t understand why something simple might be more difficult. They can’t offer a helping hand. They can’t care about it, can’t invent for it, can’t make space for people with it — and for those with AMD, they can’t spot their fellow community members with AMD unless it comes up in conversation. These aspects of invisibility add to feelings of isolation for people with AMD. That sense of aloneness, your experiences little understood, is at the heart of what we hear from you, our community, over and over again. We don’t think it needs to be this way. It has always been an integral part of our mission to offer hope and empowerment to the AMD community. When we sat down with a designer to come up with the design, we had some important criteria. We wanted to create something you could be proud to wear. Something elegant and attractive, curiosity provoking, and eye-catching. Something that would spark conversations. A pin that would make the invisible visible, but in a way that puts you in control of the conversation. The pin is designed with symbolism that can help you remember shareable facts about AMD, but abstract enough that you don’t have to find yourself on the spot. After all, our moods and willingness to go into more in-depth conversation can change throughout the day and in different social settings. It’s designed to give you more control over how little or how much you share at any given time. Eyes – AMD is an eye disease. Three Orange Dots – by the age of 75, 1 in 3 people become at risk for AMD, the third leading cause of blindness worldwide. Blue Iris – People with blue eyes are more at risk. Center Starburst – AMD leads to central vision loss as the disease progresses. Orange ‘petals’ surrounding the iris – Represents the marigold, and the protection nutrients derived from the marigold (lutein and zeaxanthin) offer in reducing the risk and progression of AMD. With 11 million people diagnosed with AMD in the U.S. alone, imagine if even 10% of you wore this pin on any given day. That’s over a million people! 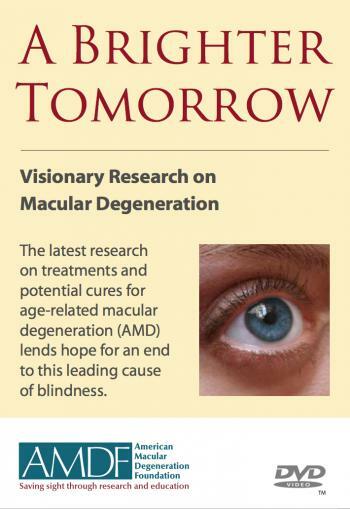 Imagine the thousands, or hundreds of thousands of conversations that could be sparked daily around the country about AMD from that simple act. To ensure that we can get this pin into as many hands as possible, we’re making it available at any level of donation. If you only have a few dollars to give, we’ll send you a pin. If you want to help us cover the cost of the pin plus a little extra, a suggested donation of $25 or more will do that. And at $250 or more, you’ll be helping to underwrite other AMD education and awareness efforts, as well as supporting important research. 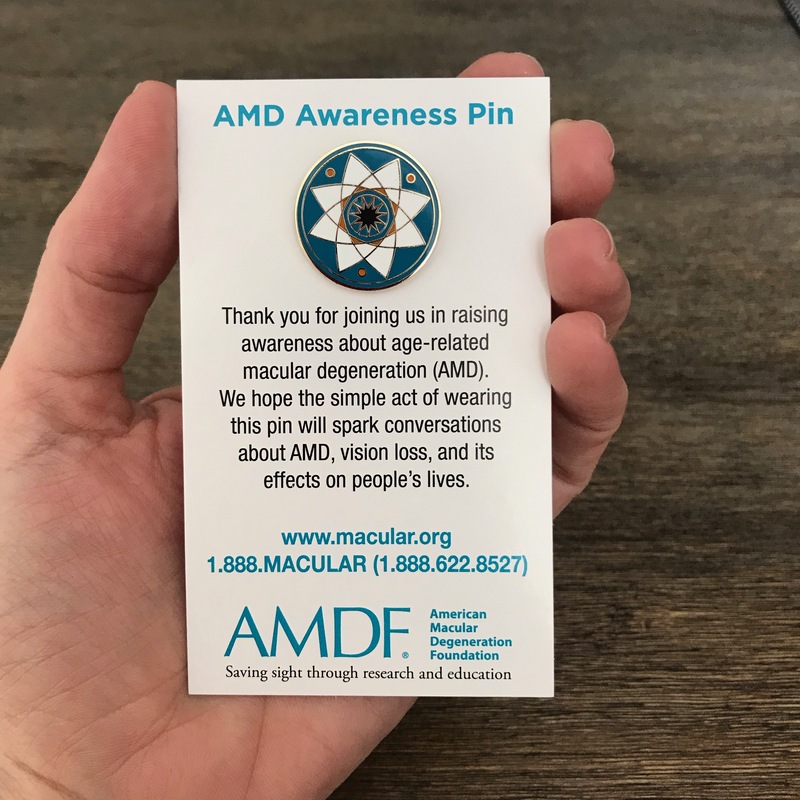 If you would like an AMD Awareness Pin, please include a note with your mailed-in donation OR if donating online, a checkbox is provided on the donation form found here. How big is the AMD Awareness Pin? 7/8 of an inch, or roughly the size of a nickel. Can I get a pin if I live outside of the United States? Yes. It may take longer to get to you, but we’re happy to send you one wherever you are if we can. 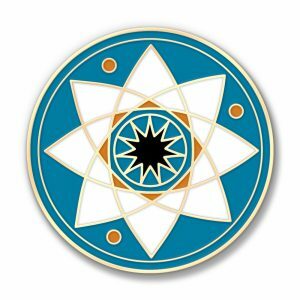 I want to get more than one pin for our organization/office. Can I do that? Please give us a call or send us an email through our contact form, let us know what you’re looking for and we’ll work something out!